The idea of “healthy” cookies can be a tough sell, I know. The whole point of a cookie is to have a treat! But luckily, there are so many cookies that taste amazing and include wholesome ingredients, that you can feel good about serving dessert. Have you seen the new research pointing out that withholding treats might backfire in terms of teaching kids how to self-regulate their food intake? (Though it also says that implementing some structure around treats, rather than having an open market, is the way to go.) Which makes sense because the more you say that a child can’t have something, the more they want it. We try to incorporate more healthful versions of favorite treats into meals a few times a week both for pure food enjoyment and to help my three year old learn that she can enjoy all foods in moderation. Of course, I’m not saying that chocolate chip cookies are a better food to serve up than, say, carrots, but keeping things balanced and making room for treats can help everyone feel happy and healthy in the long run. 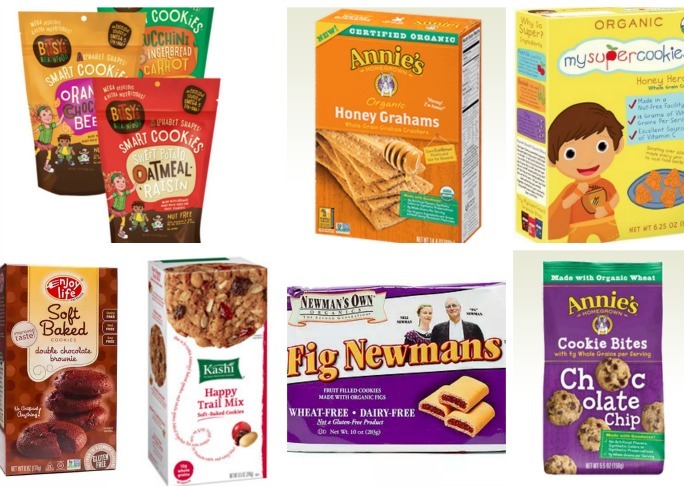 When looking at the shelves filled with cookies geared toward kids, most have surprisingly similar nutritional profiles. All of the picks here have less than nine grams of sugar per serving and a gram or two of both protein and fiber. (For perspective’s sake, that sugar level is about twice what’s generally recommended for breakfast cereal, so do consider these “sometimes” foods.) And go ahead and serve up a glass (or sippy cup) of milk alongside these best healthy store bought cookies for kids—the protein can help balance blood sugar levels to make sure kids have even energy all day long. 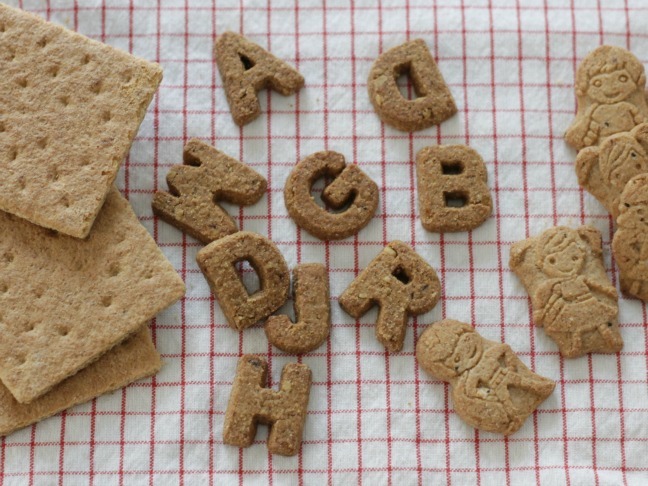 My daughter is totally obsessed with these crunchy cookies (which taste almost like gingersnaps), though it tends to be a marathon whenever we have them since she’s always determined to find the letters to spell her name. Fun letter play aside, these cookies are made in a nut-free facility and include whole grains, good fats, and some extra vitamins. Honey and molasses give these graham crackers the flavor you expect, and whole grain wheat flour adds the fiber and vitamins you want for your kid. Try spreading with cream cheese or nut butter for a fun snack, or serve up with milk for a classic after (pre)school treat. These win the award for the most fun shape! My daughter adores these little superhero cookies, and I like them because they are made with whole grains and healthy fats. They also have a pretty delightfully crisp texture and are made without nuts, so they are safe for peanut-free schools. Look for them at Target or online (here’s a coupon!). I made an exception for the slightly higher sugar content (twelve grams) in these since it’s mostly coming from the fruit filling. These are just like the fig cookies you remember from when you were a kid, only with less preservatives and no HFCS to worry about. They also happen to be free from wheat and dairy, which is nice if your child is on a restricted diet. These little bites deliver the classic taste of a chocolate chip cookie with whole grains, a bit of protein, and some fiber. They are particularly nice because their small size means that one or two in a little one’s lunch box would seem like a total treat.